History, art, food and wine, landscapes and ‘Dolce Vita’ style are just a few of the things which make a Wedding in Tuscany one of the best destination wedding choices in the world. – the Shoreside, surrounded with hills and mountains, with a coast rich in wild flora. 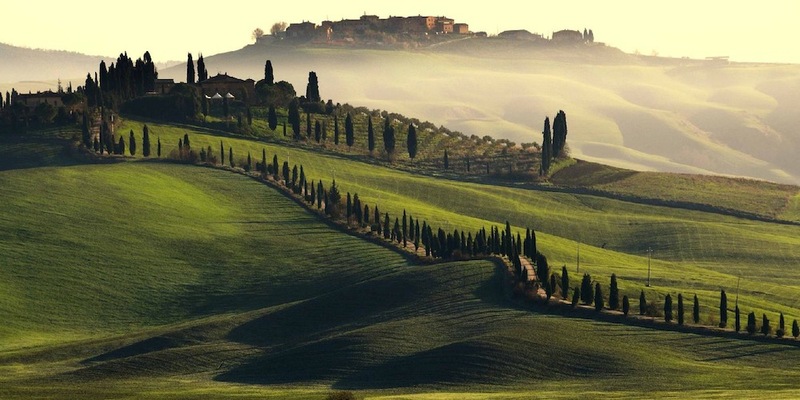 During the Medieval and Renaissance times, Tuscany was ahead of the world, mostly thanks to the artists who were born in those lands, including Giotto, Brunelleschi, Leonardo, Michelangelo, Botticelli. These artists have left behind paintings, sculptures and great architecture that we have the luck to admire in churches, museums and galleries all over Tuscany. Tuscany could be defined as the main Italian region for Food and Wine, there is a cultural tradition that compares life and food. To enjoy life at the very best you have to enjoy food, its taste and its flavours, better if in good company and surrounded by nature, with a glass of wine in your hand. Oil is maybe the main ingredient in this region. You have to try it on a simple slice of bread grilled and rubbed with a little garlic, the ‘Fettunta’ is a treat that can easily tell how simple but tasty this area can be. The most popular Tuscan dishes are Bistecca alla Fiorentina (in the Florence area), T-bone grilled steak, usually served ‘al sangue’ which means underdone; Cacciucco is typical of the seaside, it is a saucy seafood soup, originating from Livorno area; Tortelli (dumplings) with Potato filling or Ravioli (differently shaped dumplings) filled with Spinach and Ricotta cheese, mostly produced in the Appennini area, served with scrumptious sauces like the typical wild boar gravy. Also, Vegetarians will be amazed by food here, as the products from this territory are famous for their authenticity and high quality. Indeed, Florence’s signature dish next to the Bistecca alla Fiorentina is a delicious soup made of vegetables and bread, that is cooked at least twice before serving, named Ribollita. Amazing Mushrooms are also the main ingredient of many dishes, as they grow abundant in this area, like Truffle, that is another very special ingredient, with a unique taste which you will never forget. Chestnuts are also another typical product of this land, not only grilled and boiled but also chestnut flour is used to make Castagnaccio (a special thin cake made of chestnut flour and water) and chestnut honey, brown and slightly bitter. If you are Wine lovers, Tuscany is probably the best destination for your wedding, as here you’ll find some of the best wines ever, both red wines like Brunello di Montalcino or Nobile di Montepulciano and white wines like Vernaccia di San Giminiano. Following the touristic itinerary of ‘Strade del Vino’ (Wines path), you will discover hills covered by vineyards and you will drink less famous wines which will leave you breathless.